This year’s fourth and overall forty-fourth coin from the U.S. Mint’s series of America the Beautiful quarter dollars has a unique design on its reverse or tails side that is emblematic of Georgia’s national seashore. Each quarter carries a mint mark on its obverses (heads side) reflecting where it was made with “S” for San Francisco, “P” for Philadelphia, and “D” for Denver. 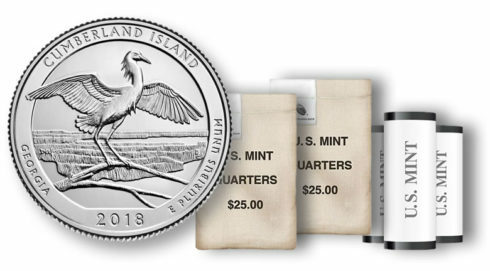 Keep in mind that it will take months to years for Denver- and Philadelphia-minted Cumberland Island quarters to make their way into pocket change, but they will eventually. Those from the San Francisco Mint, however, are produced only for coin collectors so they will not enter circulation. Buying straight from the U.S. Mint assures quick delivery of new quarters and also makes it easy to get from any of the three production facilities. It does cost more. To learn more about the quarter’s design, its official release ceremony held August 30, and a U.S. Mint coin forum held August 29, check out our information page for the Cumberland Island National Seashore quarter. When they launch at noon ET on the 27th, get the new quarter rolls and bags from the United States Mint. The bureau’s page for quarter products is online here.